Nashville, TN – March 27, 2012: The Americana Music Association is proud to present the closing night screening of Big Easy Express at the 2012 Nashville Film Festival (NaFF) presented by Nissan, April 26, at 7:30 p.m. at the Regal Green Hills Cinema. 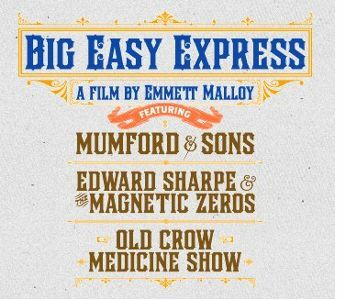 Directed by Emmett Malloy, Big Easy Express captures the incredible musical journey of three bands on one train over thousands of miles of track through six cities. Harkening back to the days of jubilant railroad revivals, of steam and steel, three bands -- L.A.'s Edward Sharpe & The Magnetic Zeros, Nashville’s Old Crow Medicine Show, and Londoners Mumford & Sons -- climbed aboard a train in April 2011 amid the massive rail yards of Oakland and set out for New Orleans on a “tour of dreams.” Stopping along the way to play sold-out shows in spots as diverse as San Pedro, California, and Marfa, Texas, the film documents the bands’ vibrant railway adventures; the high canyons, joyous crowds, blasted skies, late-night laughter, endless music ... and a train that was bound for glory. Tickets for the screening, and the films at the 2012 Nashville Film Festival presented by Nissan, which runs April 19-26, go on sale at http://www.nashvillefilmfestival.org to NaFF members on April 9, laminate holders on April 10 and the general public on April 11. Nashville Film Festival (NaFF) is a cultural arts institution that inspires, educates and entertains through an annual celebration of the art of motion pictures, year-round events and community outreach. Founded in 1969 by Mary Jane Coleman as the Sinking Creek Film Celebration, the organization’s signature eight-day April festival, now known as the Nashville Film Festival presented by Nissan, is the longest running film festival in the South. It also ranks among the most prestigious, continually garnering accolades and notice from a wide range of entertainment and trade publications, including the Associated Press, The New York Times, The Wall Street Journal online, MovieMaker Magazine, Film Festival Today, IndieWire, Variety, Billboard, New York and Script Magazine. Since 2004, the Festival has more than doubled its attendance to almost 26,000 and on average screens more than 250 films from 48 nations around the globe each year. In 2012, the festival marks its 43rd ye ar. It is hosted at the Regal Green Hills Stadium 16 in Nashville, Tennessee. Americana Music Association - Festival & Conference -- The Americana Music Association is a professional non-profit trade organization whose mission is to promote awareness, provide a forum, and advocate for the creative and economic vitality of the Americana music genre. The Association produces events throughout the year including the annual Americana Music Festival and Conference, which will take place September 12-15, 2012 in Nashville, TN. Americana Music Festival and Conference Registrations are now available at Early Bird rates through the store at americanamusic.org.